Christy Moore with Owens Wiwa at Afri famine walk in Mayo in 2006. (Photo by Derek Speirs). Letter from Owens Wiwa, brother of Ken Saro-Wiwa – one of the Ogoni 9. The 10th November 2015 marks the 20th anniversary of the execution of the Ogoni 9 by the military dictatorship in Nigeria, with the collusion of Shell. 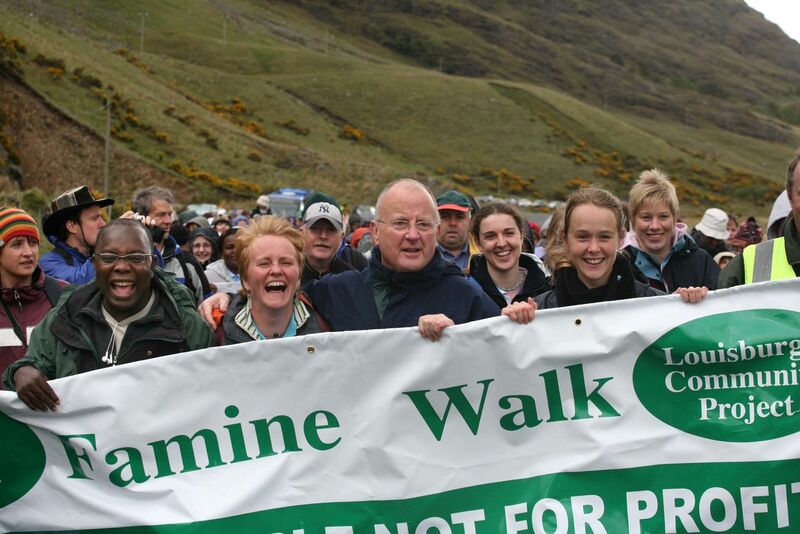 I do remember, with pride, the famine walk in 2006. It was emotional and fulfilling. I remember the inspiring speeches, the sacrifices of Christy and Vincent. Thank you for giving me the opportunity during the walk to share experiences with the people of Rossport and the wider community in Erris County Mayo. Nov 10 2015 marks 20 years of the killing of my brother and 8 Ogoni activists. A study by the United Nations Environment Programme has shown that, despite the fact that no oil production has taken place in Ogoniland since 1993, oil spills continue to occur with fierce regularity. The production facilities that Shell used to crowd out farmers and fishermen have fallen to rust and ruin, and neglected, antiquated pipelines continue to leak oil as they snake from other parts of Nigeria through Ogoniland. Fishermen and farmers can no longer make their living or feed their families from the water or the field. This is the bounty that Shell has brought to the people of Ogoniland. It promised prosperity and a bright tomorrow. When it wants to distract people from the price that will eventually be paid, Shell talks of jobs, crows about its lavish philanthropy and promises that no harm will be done, no chaos left in its wake. I heard these promises in Rossport and I fear that Shell’s bounty in Ogoni may yet be repeated elsewhere. I am hugely relieved for the people of the Arctic, many of whose families .have lived there for thousands of years, that Shell recently announced it was retreating from Arctic drilling for the foreseeable future. But this is a company that pantomimes concern and compassion for human beings when its only true concern is for where new money can be found. No doubt Shell’s sights are already set on its next oil field conquest, irrespective of who lives there or their history with that land. When my brother Ken was executed, his last words were “Lord, take my soul…but the struggle continues.” I hope Ken is watching and seeing that, yes, it does. From Ogoniland to the Arctic, to Erris County Mayo and beyond, people are rising up to say “Shell No!” They are standing strong against a corporation and an entire industry that will mortgage our future for quick profits. I can’t think of a better way to honor my brother. I want to express my solidarity with, and support for, Afri on the occasion of their 35th anniversary. I am proud that Leah and I have been Afri’s International Patrons for more than 25 years. I first came to know Afri when they invited me to a conference in 1982, which I was unable to attend because my passport had been confiscated by the Apartheid government of South Africa. However, I took up that invitation two years later in 1984 and visited Ireland at Afri’s invitation during the inspiring anti-apartheid strike by young workers in Dunnes Stores in Dublin. That strike was a unique and inspirational act of international solidarity by young people in Ireland and I continue to thank them for their contribution to the struggle for freedom in South Africa. I also commend Afri for the support which they gave to the strikers, including arranging for me to meet them as I went to Oslo to receive the Nobel Peace Prize in 1984. That strike became a template for Afri’s work in the succeeding years. They have continued to be involved in education, awareness raising and campaigning on a wide range of issues from opposition to the dictatorships in Latin America throughout the 1980s to their support for communities affected by the activities of Multinational Corporations today. I have been impressed, for example, by the way in which Afri supported the Ogoni community in the Niger Delta before, during and after the execution of Ken Saro-Wiwa and his colleagues, and how they have linked this struggle to that of the people of Rossport in the West of Ireland who are currently facing threats to their health, safety and environment by the multinational consortium which is seeking to extract gas in that region. Afri is admirable in that it has never shied away from making the difficult but necessary local global links. Afri continues to work on a range of other challenging issues: such as support for the lifting of the blockade of Gaza; highlighting the dangers posed by global warming, climate change and peak oil; and campaigning against the ongoing obscenity of the global arms trade, costing more than 1000 billion dollars annually while a billion people in our world suffer from hunger. Afri is a small organisation with a global reach, whose creativity and imaginative approach give it an ability to punch above its weight. Afri represents a dissenting voice that sometimes goes against the grain, an extremely important role in society, especially at a time when the dominant approaches have brought us to a situation of grave inequality and crises. I reaffirm my support for Afri, my congratulations on their 35th Anniversary and my belief that organisations like Afri are now needed more than ever and that they should be supported and encouraged by all who believe in democracy in Ireland and beyond. DONAL O’KELLY and SORCHA FOX. The Sugar Club, Lr. Leeson St.
Tickets 20EUR Booking 01 8827563. Proceeds to Afri’s Rossport Fund.